Senators John McCain and Joseph Lieberman have been traveling around the country together repeatedly charging that Sen. Barack Obama’s foreign-policy ideas are “naive” and even “reckless.” But what they hope their audiences will forget is that both of them were taken in by the most-successful foreign-policy con man — and apparently a close friend of Iranian intelligence — of his generation, Ahmad Chalabi. A master manipulator, Chalabi, of course, was the “Man Who Pushed America to War”, the title of Aram Roston’s new biography, and, as such, is probably someone both McCain and Lieberman would like to forget, particularly in light of the latest reports in Time magazine and McClatchy newspapers regarding his close ties to none other than the commander of the Iranian Revolutionary Guards’ elite Qods Force, Gen. Qassem Suleimani, the man whom Lieberman has accused of responsibility for the deaths of hundreds of American soldiers. Those ties, as well as apparent complaints by Prime Minister Nouri al-Maliki, have resulted in U.S. officials in Iraq once again cutting all contacts with Chalabi and what remains of his Iraqi National Congress (INC). But it’s worth remembering that it was Lieberman, along with Trent Lott, who led the effort in the Senate to fund Chalabi and the INC through passage of the Iraqi Liberation Act in 1998, and it was Lieberman and McCain who served as the two “honorary co-chairmen” of the Committee for the Liberation of Iraq (CLI), the elite group that was put together by the administration and Chalabi’s pals at the American Enterprise Institute (AEI) and the Project for the New American Century (PNAC), to lobby for invading Iraq in the fall of 2002. And it was Randy Scheunemann, who now serves as McCain’s principal foreign-policy adviser and spokesman, who both authored the Iraq Liberation Act (when he was working on Lott’s staff) and subsequently served as CLI’s president. Shortly after Bush memorably declared the end of major hostilities from the deck of the U.S.S. 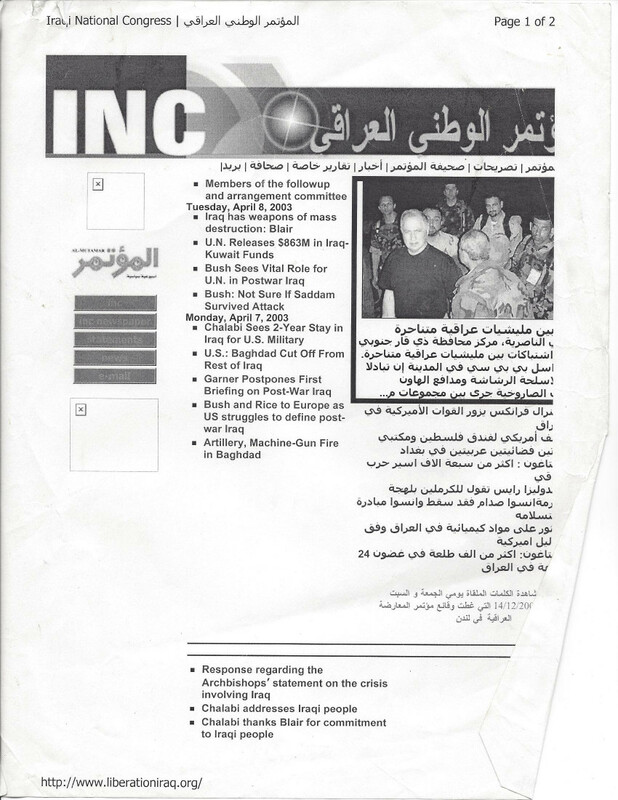 Abraham Lincoln on May 1, 2003, the CLI announced its own dissolution, declaring on its home page, “Following the successful liberation of Iraq, the Committee has ceased its operations. To contact Randy Scheunemann, President of CLI, please write to the following address: 918 Pennsylvania Avenue, S.E., Washington, DC 20003.” Thus, like the administration and its neo-con allies, Scheunemann and his two honorary co-chairs failed totally to anticipate the insurgency that was already building against the occupation. Now, the close connections between CLI and the INC were always pretty clear; Scheunemann’s role, as well as the presence of Chalabi’s chief Washington sponsors since the mid-1990’s — Richard Perle and James Woolsey, among others — on its board certainly suggested a strong coincidence of interest, at the very least. But on April 8, 2003, I happened to type in the CLI website (http://liberationiraq.org/), and, to my great surprise, got the INC website instead. I was so surprised that I immediately printed out what appeared on my screen, a scanned copy of which you can see here. (Note the address on the bottom and the destination at the top.) I then phoned Scheunemann, who mumbled something about how both the CLI and the INC used the same server in London. But it seems that the two sites were being run by the same entity or, worse, that the INC, which, perhaps not coincidentally, was based in London, used U.S. taxpayer money to run CLI’s website as well as its own. Given Lieberman’s and McCain’s sponsorship of the organization, even if only “honorary,” it seems frankly unseemly for the two of them to now charge Obama with being dangerously naive about foreign policy and what it takes to deal with crafty and malevolent Middle Eastern leaders, like Iran and its friends and allies. Not only were they completely taken in by Chalabi and the INC, but they were also, as Paul Wolfowitz now admits, completely “clueless” about what U.S. troops would face once they got to Iraq. And they obviously either failed to consult or disbelieved the Iraq experts in the State Department and the U.S. intelligence community, not to mention former Centcom commander Gen. Anthony Zinni, who had long before concluded that Chalabi was a con artist who could not be trusted. With sophistication like that — in contrast to Obama’s naivete — a McCain administration would seem ripe for the picking by would-be Chalabis, if not by the master himself. *For those too young to remember, this is a pun on the “Bobbsye twins,” two sets of twins whose fictional adventures made for some 74 volumes of juvenile fiction beginning in 1904. Jim, I was wondering if you read Paul Craig Roberts attack of the Iraq propaganda vis a vis Al Sadr. Al Sadr is widely criticized as being in league with Iran. Yet, PCRoberts suggests that he is the most pro-Iraqi Shia leader. Yet, the reporting we’ve heard has tried to conflate Al Sadr with Iran. This nasty nexus between Chalabi, (and Al Maliki for that matter) and Iran seems much tighter. Now it appears Chalabi is a venal man, ergo his affiliation is open to the highest bidder. Al Sadr, like Nassrallah seems to be his own man and principled. They both seem to have the ability to restrain their legions, to make thoughtful, calculated decisions. I am not so sure about ourselves, sadly. I believe the Neo-cons are right when they call for democracy. Unfortunately, they don’t believe in their own credo–or haven’t found conditions suitable to allow the dirty Arabs their own representation. This sounds like Cuban history from 1903-1955. We call for democracy, undermine that democracy for our own machevellian ends–offending those whom we democratize so long as they dance to our tune. It seems those who respect democracy might try to influence those allies who’s own democratic standing is thin. Egypt, Saudi Arabia and Jordan will be overthrown by their own people who at that point will harbor deep resentment for our double standards. It seems those who respect democracy would push for (gradual) reforms like a liberalized press, political alternatives to the lone ruling parties that dominate their people. We are fighting ourselves here. Pity, the press misses these hypocrisies. The neocons don’t call for democracy….they call for empire. The American people are being swindled by con-men into supporting a drive to create a hegemonic empire, run by Washington, in turn heavily influenced by Israelis and their agents, weapons merchants, and other mercantilist interests. And we shouldn’t forget the Israel lobby and its pernicious influence on American foreign policy. As for democracy, it doesn’t work if the “electorate” is ill-educated and there’s no civility nor willingness to compromise. Iraq doesn’t have democracy, neither does Afghanistan. As for American democracy, it gave the country Bush and the idiots in Congress. So what’s so good about it? Before one begins airily supporting democracy in the Middle East, it is important to take into account the recent history of the Arab world, particularly the former Ottoman territory which was liberated – and immediately re-subjugated – by Britain and France after World War One. Virtually all of the borders and most of the governments, imposed on the former Ottoman Arabs in the decade following that world conflict still exist. The “nations” so established were intentionally designed to be weak, so that they could be kept in line and under control by their neo-colonial masters. This scheme was in direct contravention of repeated promises of unity, independence and self-determination made by the British and French to their wartime Arab allies (the Arab Revolt). It is only a slight exaggeration to say that all of the reactionary evils that hem-in the core Arab region and corrupt Arab politics from within – the existence of Israel, the existence, extent and influence of Saudi Arabia, Lebanese-style sectarianism, the strength of the theocratic movements; whether emanating from the Muslim Brotherhood, Riyadh or Tehran, the current weakness (one hopes, temporary) of the Pan-Arab national movement – either originated or owe their strength and influence to western imperialism. According to a proper understanding of this history it is obvious that any and all US interventions in that part of the world – regardless of the usual lofty and laudable stated motives – are basically and ultimately imperialistic. Nations and peoples are seldom freed from imperialism through peaceful democratic actions. Particularly in the Middle East, where so much power and wealth is at stake, and where a neo-colonial shceme is so deeply entrenched, any movement, party, or coalition capable of overthrowing the present system is likely not going to be perceived as democratic, pro-western, or peaceful. “When we search out the aims of the nefarious games, Of the war party’s persistent goals, Dissent helps forestall the inexcusable gall Of these power-mad, conscienceless souls.